William Schooler, born about 1640 in London England, married Unknown. William Schooler died about 1728 in Caroline, VA.
William Schooler and Wife Unknown had a son named Thomas Schooler. Kesiah Bourne, born about 1680 in London England. John Schooler, born about 1705 in Essex, VA.
John Schooler married Martha Wharton about 1720 in Virginia. Martha Wharton was born about 1705 in St. George Parish VA.
John Jr was born 17 September 1742 in Saint George's Parish, Spotsylvania VA.
John Schooler Jr. married Nancy Catherine Hawkins, born about 1750 in Spotsylvania VA.
John Schooler Jr and his wife Nancy Catherine Hawkins had a son named __________ Schooler. ________ Schooler married Catherine __________, born about 1781 in VA.
________Schooler and wife Catherine had a son named Dillard Collins Schooler, born 1809, married Jane Garrett in 1826 in Madison KY. Jane Garrett was born in 1808. Dillard Collins Schooler and wife Jane Garrett had a daughter named Permelia S. Schooler. Permelia was born in 1840 and died in 1905. Permelia was married to James Robert William Lincycomb. James Robert William Lincycomb was born in 1837 and died in 1904. Family stories say that James Robert William Lincycomb killed a man for assaulting his sister, and he abandoned his wife, possibly taking two of their children with him when he left the state. Permelia and James were divorced in 1887, on the grounds of desertion. However, I've also found a record of a James William Lincycomb being buried in Leola Cemetery, Leola AR. So that story of desertion doesn't quite match up with this. 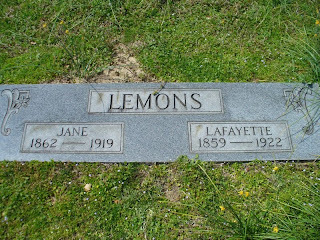 Clearly, she was known by family as Jane Lemons -as that is how she is recorded on the tombstone pictured below. Joyce Jane Lincycomb married James Lafayette Lemons on 12 May 1881. James Lafayette Lemons was born 14 March 1859 in TN. James Lafayette Lemons died 20 December 1922 in Smackover, AR. Here is their grave marker, as you can see, James Lafayette is listed as Lafayette, and Joyce Jane is listed as Jane. 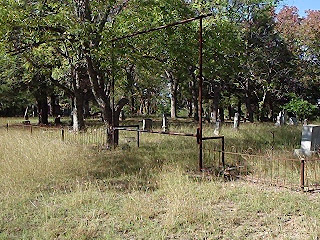 They are buried in Leola Cemetery, Leola, Grant County Arkansas. *I have also seen the name spelled as Lineycomb and Lipscomb but I believe it to be Lincycomb.